Omar's recent post, which contained details of his print drying method, attracted a bit of attention in the forums where I gave it some "publicity". It's obviously a perennial problem and people have come up with their owns ways of coping. Omar's is a good technique and so, too, is one that was published in some detail at the Film and Darkroom Users' Group (FADU) five years ago by Dave Miller. Some readers of this website will no doubt have seen it but I thought it would be a good idea to show it here for those who have yet to try it. Dave kindly agreed and the article and his pics are below. Following his article, I've posted some of the comments that were left on the other forums. I've just cut and pasted them in a non-attributed fashion in case someone fancies giving these methods a try. Since we're on the subject of FADU, can I urge everyone who is not already a member to go there right now and sign up? You register here. I have to say that of all the forums and websites I've been to and had some involvement with, FADU is by far my favourite. It could be a bit of parochialism at work here as most members are from the UK. But putting that aside as far as I can, it's the friendliest, most helpful place for film and darkroom enthusiasts and has the strongest "community" feeling to it. FADU members are very welcoming and it's almost unheard of for anyone to talk down to newcomers. The prevailing attitude seems to be that the only daft question is the one not asked. If you do become a FADU member, it would be good if you could leave a comment at the end of this post to that effect. If you decide not to bother, consider yourself ex-communicated. :-) Now onto Dave's article. 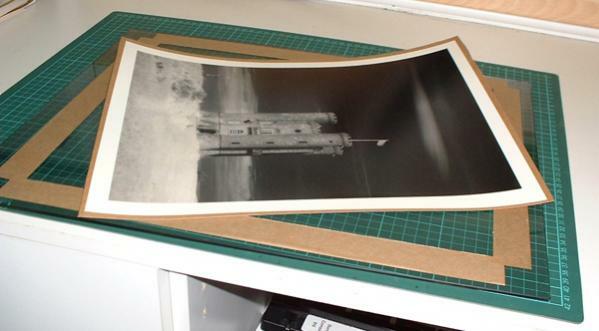 When we work on fibre paper prints we sometimes have difficulty in obtaining a completely flat print. The drying method described here, which guarantees a flat print, is one that I came across some years ago, and I’m no longer sure where, possibly Camera and Darkroom magazine. It’s one that I understand is favoured by watercolour artists who sometimes use it to pretension their paper prior to commencing work. We can make use of the principle, but in reverse. I should point out that the method is not really suitable if you are making a large number of prints at any one time when traditional methods, drying frames and pressure pads may be a better option for you. As a guide I rarely produce more than five 16” x 12” prints in a session, the method described here suits that sort of through put. An explanation of what drives the process first. Fibre paper absorbs a lot of water during development. This causes the paper to swell, and expand quite considerably. On drying the paper shrinks back to close to its original size. To illustrate the considerable amount of expansion, and shrinkage involved, carry out a measurement of your handiwork in both its wet and dry state. We can harness this shrinkage to prevent the buckling process that normally accompanies drying and thereby produce the flat prints that we crave. I suspect that this method works in part by slowing the drying of the paper to close to the rate of that of the emulsion since the moisture can only escape through the front of the work. Prints finished in this way, and left unmounted, will stay flat for many months provided that they are not subjected to high humidity, and are correctly stored. You will however lose a few millimetres off each side of your paper due to the final trimming required. An allowance for this loss, of about ten millimetres on each edge, should be made at the printing stage. 1. A roll of 15 to 20mm wide gummed paper tape. Brown paper parcel tape with a water soluble adhesive is required, not so easy to locate these days, but still available in most stationers or arts and crafts shops, and dare I say it, on eBay. 2. Flat glass or plastic sheets 3 to 6mm thick, whilst these sheets need to be a manageable size they must be at least 10cm larger than your print. I use glass shelves out of old refrigerators. One side of the sheet needs to be smooth, and the sides, and corners should be ground down to remove any sharp edges. Old fridge shelves have the advantage of being made from toughened glass; rigid plastic sheets are also ideal. 3. A good supply of paper hankies, the man-sized version are best. Some prefer a soft damp chamois leather kept specifically for the task of mopping surplus water off your print. Commence by taking your processed, well washed fibre print, and lay it face down on your glass. Gently wipe off excess water with soft tissues, or chamois, lift the print, wipe the glass, lay the print on it, face up this time, and repeat the process. The idea is to remove as much surplus water as possible. Be careful not to stress the print surface. One could use a squeegee for this purpose if preferred, but remember wet emulsion is delicate. Now lay the print, face up, on a dry sheet, and press it down using a clean, dry tissue. Remove any trapped air from underneath it. Tear off four strips of paper tape, each a little longer than the length of your prints edges. Moisten these in turn with a wet tissue, and stick your print to the glass with them. The tape should overlap the print edge by about 4mm, press it down firmly with a tissue. Set the assembly aside and leave it to dry overnight in a clean environment, don't try and rush things by heating it. Here I must confess to having made use of our clothes airing cupboard on occasions where time was short, but I cannot recommend it to start with, too fluffy by far! Next day you will be greeted by a drum-tight print. 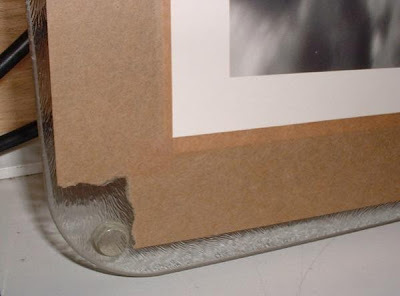 Take a sharp knife, and slice through the tape around the edge of the print to release it from the glass. Trim off the edge of the print to get rid of the remnants of the paper tape. Mat print, job done! What can go wrong? Well, until you are practised in this method, a couple of things. 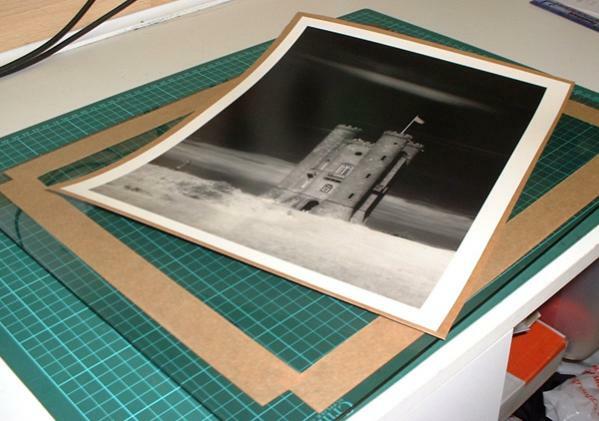 You may find that the paper tape has torn or lifted along one or more sides as the print dries. This is normally due to the tape not having adhered to the glass, or print properly, usually because it wasn't quite wet enough. Conversely, when you cut the tape you may find that the print will not release from the glass, possibly over it's whole area or perhaps just an edge or corner. This is because either the tape, or the print was too wet, allowing some of the dissolved tape adhesive to wick under the paper and stick it down to the glass. In either case immerse the sheet in water for about half and hour, until the tape floats off the print. Give the print a further five minute wash to remove all traces of adhesive, wash and dry the glass, and start again. The procedure will soon become second nature and will not normally occupy more than a few minutes, much less time than the traditional method since the need to flatten the print is removed. The first is drydown, this is the difference in contrast and dmax of a wet and dry print. This will change with this drying method so whatever method of compensation you use must change too, probably by a reduction in the exposure allowance that you make. Another is print size. With normal drying methods you will end up with an image close to the projected dimensions. With the method described above your picture will be slightly larger than projected, do some before and after measurements to establish this change if you consider it important. I have the bulk of my mats cut for me by Carters Mounts, and prefer to mount with a small border showing around the image, therefore I make an adjustment by reducing the projected image size, so that the dry size fits the mat; a complication some may not wish for. There are, of course, two sides to a sheet of glass, but here, in case you get any ideas may I remind you that, as in the rest of life, it’s better to learn to walk before attempting to sprint. * A quick way to flatten dry FB photographs is to "break" them. This I do by dragging them (face up!) stretched across the edge of my work bench with a measure of reverse curl. A bit of practise will see you getting them usefully flat in seconds. * It all depends on how flat you need them to be. I generally don't have a great deal of problem with print curl but when I do I make sure they are completely dry then put them face down on a piece of towelling. I then use a metal ruler placed at the top edge of the print and with it pressed down lightly pull the print from under the ruler and at the same time moving the ruler gradually to the opposite end of the print. This will knock out the most severe curl, but it may need doing again but this time from side to side, and if it need a 3rd try length to length but the opposite way to the 1st stage. It will now be flat enough to mount, but if it is only to be stored unmounted you could try placing it under a sheet of MDF Board with a heavy weight on to for a couple of days. * I typically use an old Arkay simple single sheet drier with a slightly curved ferrotyping surface and apron/clamp. I'll flip the print like a hamburger or pancake as it dries. This usually confines any curve to a very slight bowing toward the emulsion side, but without irregular buckling or uneven curly-fry edges. The slight bowing tends to relax and tighten a bit over time due to normal ambient humidity fluctuations, but even my decade-old prints dried using this technique are still flat enough to look good with archival tape conservation mounting (not heat press dry mounting). * Blotter rolls worked great. Too bad we can't buy them anymore. Without blotter rolls, dry mounting is the best and easiest. You can even just dry mount to the dry mounting tissue, leaving mat board for later if ever. Once the tissue cools, it's not sticky. 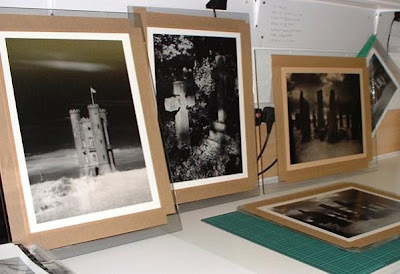 * For 30 years I've air dried my prints placing them face down, after squeegeeing excess moisture from both sides, on home made drying racks mounted on kitchen drawer runners under my dry bench in the darkroom. I leave them overnight on the racks but switch off any form of heating to ensure that they dry slowly. When dry they have a gentle curl at each end of the long length of the print. After another 24 hours I place the print in between two pieces of perfectly dry acid free board in a flatbed dry mount press at 60% heat for 2 minutes then remove them and immediately place the print under a few mounted 20 x 16 prints to allow it to cool. after 10 minutes I remove the print and place it in a portfolio box for storage. This is the critical part, before I started doing this my prints curled as they dried. I learned this in the USA where they use a special heavy metal plate with handles on to lift it. * I hang prints to dry back-to-back. They dry with a slight curl only. This is fine for mounting with a linen tape "T" in a mat. If I need flatter, I use the dry mount press. * I have done similarly by very lightly misting the backs of dried curled prints before giving them a quick shot in a heated press. The idea was to simulate the "steaming" effect of ironing shirts in order to remove the curling. It worked beautifully. But it also had a tendency to affect the surface texture of the print. It flattened the normal textured surface of air-dried unferrotyped glossy prints. This tended to reduce the "sparkle" and give a veiled look I found quite unpleasant. While the method described in the link doesn't use heat or clamping, it does use pressure against the surface texture of a lightly dampened print. So when using this method it might be wise to keep an eye out for those texture changes. I should also note that I regularly fix prints in homebrew Kodak F-24 fixer, which is non-hardening. This helps with subsequent toning, but may also increase the chances for surface texture alteration. * FB prints can be prevented from curling by soaking them in a dilute solution of glycerin or similar humectant before drying. Try 2 ounces of glycerin and 30 ounces of water. Depending on your average local humidity the amount of glycerin can be altered. *I used to dry FB prints with a hairdryer. It's a labour intensive method but gets prints flat enough to finish off under a pile of books. Squeegee away excess water and point hair dryer at one side of print from about one foot away. As soon as it curls towards the hair dryer, point at reverse side. Continue the process. Towards the end the print will hardly curl at all when heat is applied. Typically, the print will be flat or show a very slight upward or downward curve that can be cured by weight. Cheap, but time consuming. * I put them in a blotter folder. You can get them at any real Office supply store and then with a bunch of weight on top. Mostly books. * You need to dry them flat, not to flat them after they dried. After washing, I carefully wipe the excess water from the emulsion side and the back of the sheet with a car wiper. I then dry them emulsion down on the gray cardboard side of a cereal box. Never had a warped sheet. * I try to flatten my FaceBook prints with links to my Flickr prints. I'll second Bruce on FADU - there's some damn helpful people on there and it is always friendly. As for Dave's flattening technique - it totally reminds me of stretching cartridge paper at college in preparation for painting. Now off to register at fadu.. Thanks for the tips. Thanks for the heads up about FADU. Just joined. OK, as per request, I joined. Thanks for the tip. My drying technique, is similar / hybritt of this. Only 1 step added that vastly improves the flatness. All drying without a Press, -> That doesn't work for me, I have a lot of bubbling on sides. 1- So make your print. 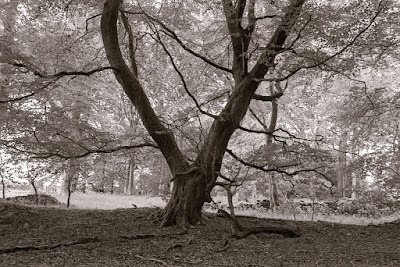 3- add 1 bath, of "stabilizer", I use Adostab from Adox, I remarked it softens lightly the emulsion, to let it dry slower, almost the speed of the paper. 3- Let them dry Flat, with the Emulsion up, I lay them down on large cotton towels. !!! not longer than 1 night on the towel, because the moist towel could bring fungus. !!! 4- at the end of this flat drying the print is "almost" flat. Only slight slight curving on the sides. - but this is not perfect of course. Lets make it perfect. 5- So I use " flat" countertop wooden planks. Without texture, 2 plates - 1 on bottom 1 on Top. They leave no traces on the print as long as they are clean. - Lay the print, emulsion down, on to countertop A. - With a Moist cloth, ( hot water), moisten lightly the "back" of the print, just slide over it once. - Lower carefully, the 2nde counter top on it. So the print is sandwiched.